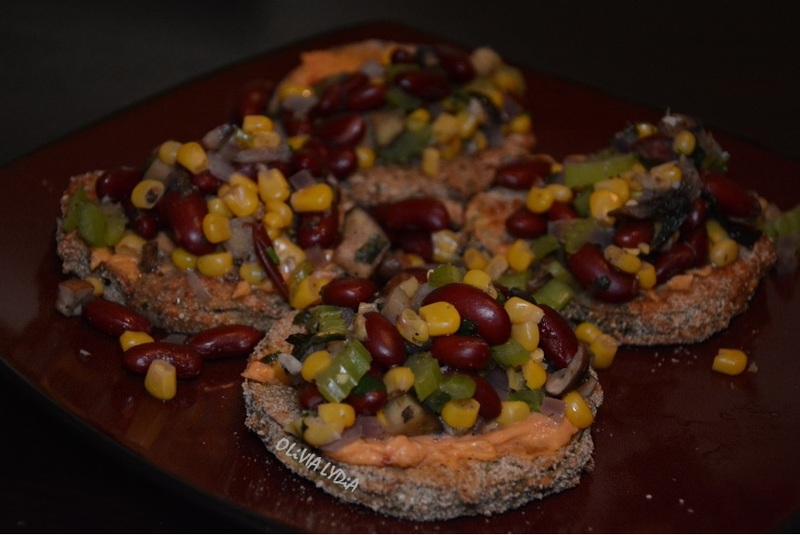 Eggplant Toppers: Breaded Eggplant & Red Bean Salad – Olive For Greens. Eggplant is one of the most popular vegetarian/vegan go-to foods because they are a hardy, filling vegetable. I love coming up with new ways to make eggplant. This recipe was inspired by a meat recipe I saw on television. I remember thinking to myself, “I can swap the beef for eggplant.” I think there was a 3 bean salsa on top of the beef. I think 3 beans might have been too must with this particular dish, so I chose one. And instead of Mexican, I went in an Italian-ish direction. 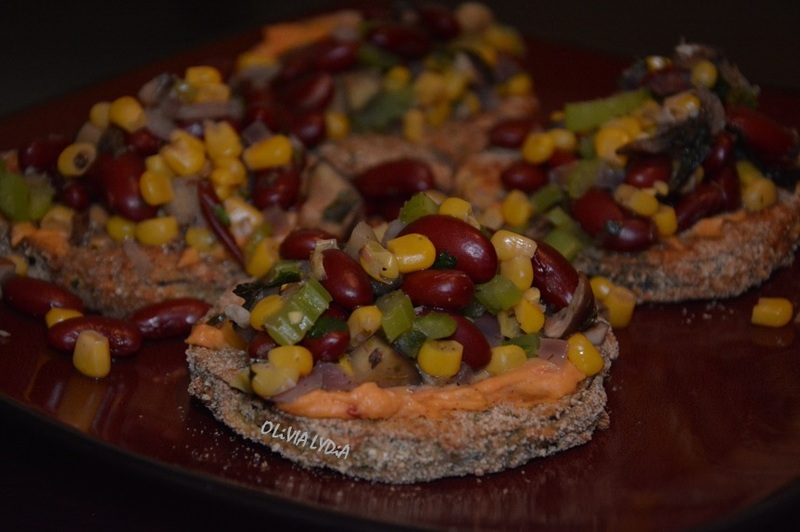 This is a layered dish with eggplant, hummus and warm bean salad. It’s amazing as a side dish with a huge green salad or an appetizer! Note: I used roasted red pepper hummus. Preheat the oven to 375 degrees Fahrenheit and line a baking sheet with parchment paper. Dip the eggplant slice into the egg then the flour then back into the egg then the bread crumb. Place on the baking sheet and repeat. 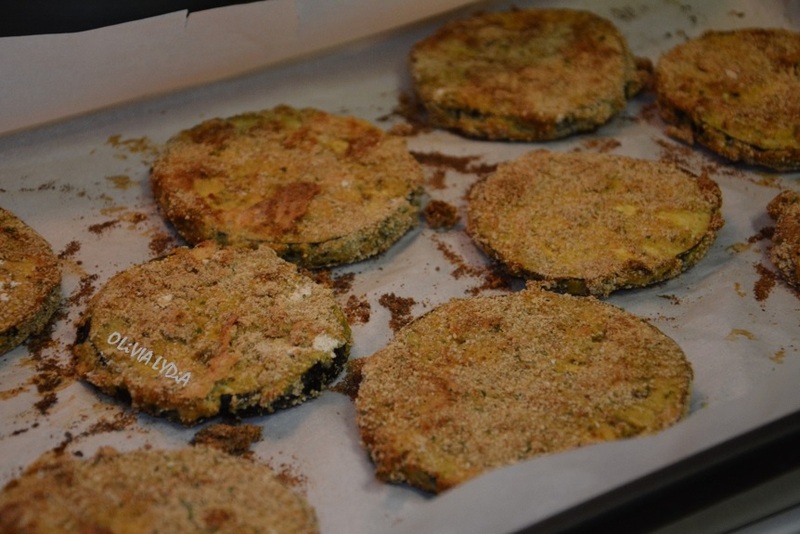 Bake the eggplant for 15 minutes, flip, then bake for an additional 15 minutes. In a medium pan add the coconut oil, garlic, celery, onions and mushrooms. Sauté for 10 minutes over medium heat. Next, add the parsley, basil, oregano, bullion, water, corn and beans. Lower the heat and cover for at least 15 minutes. When the eggplant is done, spread desired about of hummus on top- the hummus will act as “glue” between the eggplant and the bean mixture. Next, top with a scoop of bean mixture. Enjoy!